Xavier lets you view a client's unreconciled bank transactions. It uses Xero's Bank Statement Report data to do so. From each record, you can click straight into Xero to start the reconciliation process. This insight allows you to quickly order by the oldest records (useful if you are approaching month end), and also see/filter/group the records that are in a "locked" period. You can also hit the View All Items button at the top of the insight to work with all bank statement records, not just the unreconciled ones. Xero guidance on bank reconciliation can be found here . The results shown in this Xavier insight are your Xero contacts that we’ve identified as potential duplicates. This can happen if you create a new contact during the process of inputting an invoice or similar, and miss the fact that the contact already exists. Review these, you may dismiss any which aren't true duplicates, or clicking the name of the contact will take you to Xero to amend them. The transaction count should give a good indication of which contact has had more activity. Xero guidance on merging contacts can be found here . Each Invoice and Bank Transaction line item is assigned an Account Code and a Tax Code in Xero. The majority of the time, these codes should be consistent for a given supplier or customer. It happens to be best of us though - sometimes these records are assigned the wrong codes, or coding evolves over time. We’ve crunched the numbers to find these potential mis-codings and you'll see them presented in this insight, with helpful links directly to Xero allowing you to amend these where needed. Xero provides a dedicated mechanism for re-coding, and their support documentation on this is here . Active During: This is the period where you want to find contacts to assess. Xavier will find and evaluate contacts that have been active (i.e. they have transactions) during this time period. For example, this could be your reporting period of the previous month. 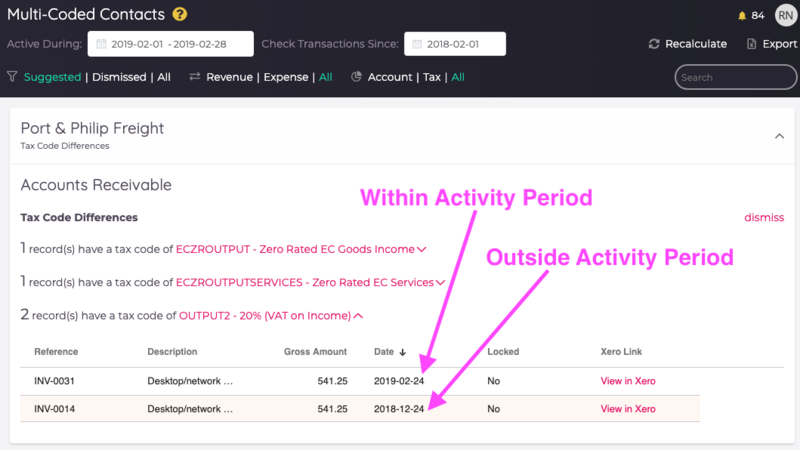 Check Transactions Since: Once Xavier finds the active contacts to evaluate, this date refers to how far back in time Xavier should look into each Contact's transaction history to compare account and tax codes and surface any inconsistencies. For example, if you know that you changed your accounts structure at the start of the year, it doesn't make sense to evaluate transaction history before the change, so set this date to be the 1st of January (or whenever you made the change). The Multi-Coded Contacts insight allows you to get really targeted with the data cleanup process, and quickly filter out any suggestions that don't make sense for your situation. Revenue | Expense | All: Restrict the suggestions list to only transactions relating to Revenue OR Expenses. Account | Tax | All: Restrict the suggestions list to only transactions Xavier has identified with Account Code anomalies, OR Tax Code anomalies. You can review the transaction history of these contacts and decide whether or not to apply Xavier's suggestion. Dismissing the suggestion will hide it from the "Suggested" list, but you can always undo this from the "Dismissed" list if you want it back. Xero's support documentation on settings for Contacts is here . This view identifies GL Accounts that have not had any transactional activity recorded against them from the "Dormant Since" date you supply. You can review the transaction history of these accounts and decide whether or not to take action on Xavier's suggestion. The idea is to help you identify old account codes that could be cleaned up, either through archiving or deleting, for better reporting. You can filter and sort to look at accounts with transactional history (activity) and also by Account Class. Xavier won't show you Xero System Accounts as they cannot be archived. For each account found, you can follow the link to Xero's Chart of Accounts to archive or delete the account, or you can dismiss it. Dismissing the suggestion will hide it from the "Suggested" list, but you can always undo this from the "Dismissed" list if you want it back. Read more on managing account codes in Xero . 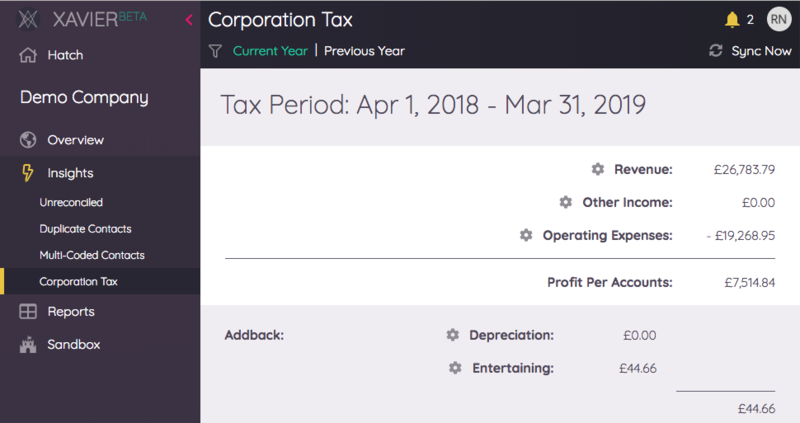 The Corporation Tax insight gives an estimate of the corporation tax accrued by a company for the current and previous financial years, based on UK tax rates and using the financial year-end dates in the Xero settings. 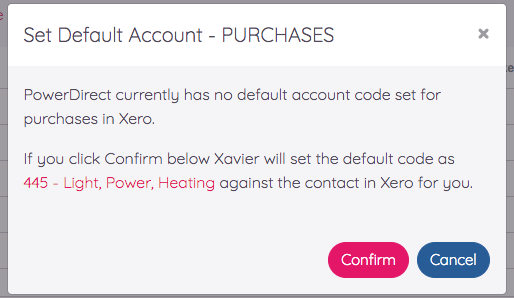 In terms of how the different elements are calculated, Xavier starts your team off with some defaults based on the chart of account's Account Type and the Reporting Codes provided by Xero. Reporting Codes are applied to all Accounts, and can be customised in Xero by your team. They are a great way of achieving reporting consistency across clients that have different chart of account configurations. But you only have visibility of Reporting Codes if you are a Xero Partner, and sometimes it is not feasible to configure these for every client you work with. Xavier allows you to override the default corporation tax calculation for a client. By clicking on the cog beside an element of the corporation tax view you will see what is currently being used for that section of the calculation. 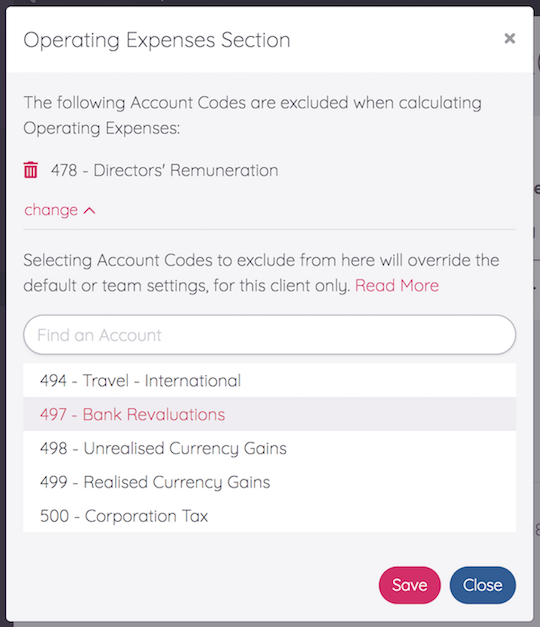 Specifying account codes means that the default calculation will no longer be used for this client, and Xavier will instead use the account codes provided. Upon clicking Save, the corporation tax will be recalculated for current and previous years based on the new configuration. You can remove account codes from the calculation at any time, and removing all of them will result in the calculation reverting back to using the Xavier defaults. The VAT Tracking insight gives an estimate of the VAT accrued by a company for the current VAT period, and includes estimates for previous periods dating back to the end of the previous financial year. The financial year and VAT periods are based on the client's settings in Xero. In the UK, a company could be configured to report VAT to HMRC on a Cash basis or an Accrual basis. 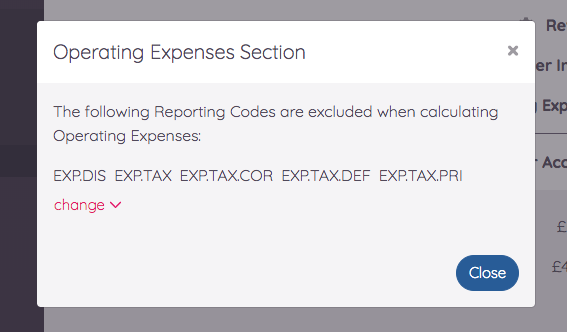 Xavier automatically detects this based on Xero settings and adjusts the VAT calculation accordingly. You can adjust this for a client at any time by clicking on Adjust Rate in the menu bar of the VAT view. For the Cash and Flat Rate schemes, Xavier monitors your taxable turnover to ensure that you remain on the right scheme from a compliance perspective, using HMRC's defined thresholds . If such a payment is found, the Payment Detected field will be set to "Yes". Clicking on this will take you straight through to the bank transaction in Xero. Fixed Assets are a somewhat separate part of the Xero system, which can lead to some inconsistencies. 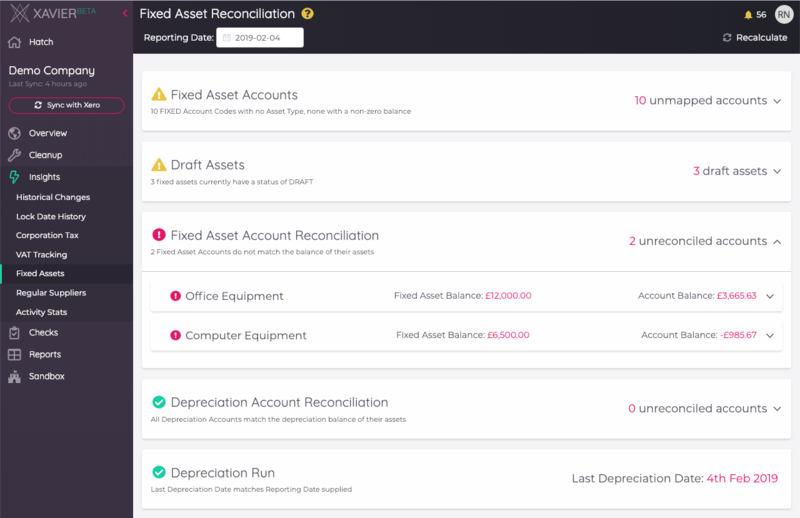 Xavier connects to the Fixed Assets register in Xero and compares it with the general accounting ledger to highlight where records may be out of sync. Xavier looks at general ledger Accounts that have an Account Type of FIXED, and then looks for mapped Asset Types in the Fixed Asset register. Accounts need to be selected as the Fixed Asset Account, Depreciation Expense Account or Accumulated Depreciation Account of at least one Asset Type to be considered "mapped". Xavier then checks the balance of any unmapped Accounts - if any are non-zero then this should be considered a genuine issue that needs immediate attention. Xavier searches the fixed asset register for draft assets and lists them here for convenience. This section is a good place to start if the asset types are not reconciling in the section above. This section cycles through all of the accounts in Xero's general ledger that are specified as the Fixed Asset Account in the Fixed Assets register. It compares their balance with the combined totals of the Purchase Price of all assets associated with it, up to the Reporting Date, and highlights any that don't match. You can expand each Asset type to compare transaction history of the Account with the Asset activity. 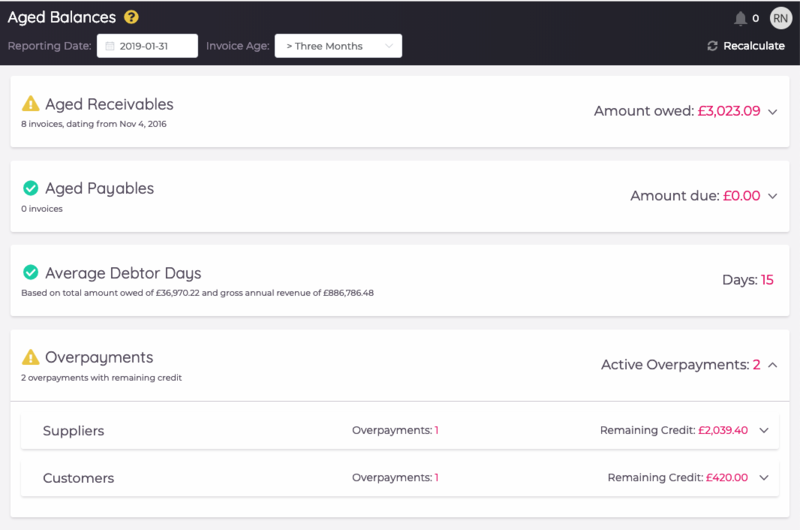 Similar in logic to the Fixed Asset Account Reconciliation, this section cycles through all of the accounts in Xero's general ledger that are specified as the Accumulated Depreciation Account in the Fixed Assets register. It compares their balance with the combined totals of the "Depreciation Value" of all assets associated with it, up to the Reporting Date, and highlights any that don't match. The Depreciation Value is a calculation of the difference between the Purchase Price and Accounting Book Value of an asset. 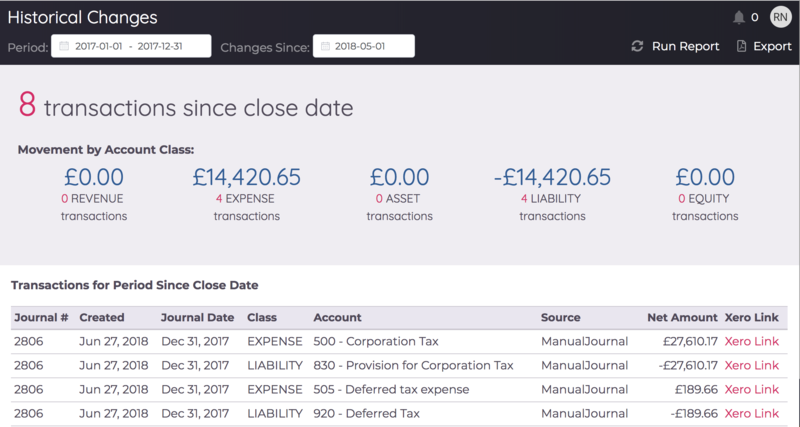 This simple check compares the Reporting Period specified at the top of the insight with the "Last Depreciation Date" in the Fixed Asset Register, and shows an error if they don't match. The Aged Balances insight looks at aged Debtors and Creditors (i.e. old invoices) at a snapshot in time. Reporting Date: this is the point in time that you want to evaluate your debtors and creditors at, based on invoice dates. Invoice Age: the age of the invoice in relation to the Reporting Date. For example, setting the Invoice Age to two months means Xavier will only look at invoices that are dated older than two months from the Reporting Date. This surfaces your debtors, old invoices for people that owe you money. You can see a count of old invoices at a glance and a sum of the total amount owed. Clicking on this card will expand to show the detail of each aged invoice, each with a link straight to Xero if needed. This surfaces your creditors, old invoices for people that you owe money to. You can see a count of old invoices at a glance and a sum of the total amount you owe. Clicking on this card will expand to show the detail of each aged invoice, each with a link straight to Xero if needed. This uses a common ratio-based method to provide an indication of the length of time it takes for your debtors to pay you. This is based on the total Receivable amount owed at the Reporting Date, and the gross revenue over the last 12 months up to the Reporting Date. The check allows you to review all overpayments that still have remaining credit available at the time of the Reporting Date, by checking the dates of any allocations to make sure they are applicable. This is categorised into Overpayments relating to Suppliers and Customers. Designed for accountancy firms utilising proposal tools such as GoProposal to determine pricing for their clients, the Activity Stats insight gives a breakdown of the key trading statistics of a company, with a focus on volume, e.g. number of bank transactions for the period. These figures can then be input directly into your proposal tool to quickly calculate pricing when a client is up for renewal. By default, this insight calculates statistics for a rolling 12 month period, starting from the last complete month, and working back from there. However, you can select a date range and Xavier will do its best to segment your date range into monthly slots. The NET value of all transactions in the selected date range that have an Account Type of either Revenue or Sales. Note that the Account Type Other Income is not included in this calculation. This gives you some flexibility in determining this Turnover figure, as the Account Type can be modified for each account in Xero. Xero provide some documentation on working with Chart of Accounts . Have you ever had that uncomfortable feeling that something in a previous period has changed after you've reported it to the board or to the tax authorities? All the accountants we know have run into this at some point. Everyone makes mistakes, and it can be quite easy for someone with Advisor privileges in Xero to create a record with the wrong journal date. The tricky thing is tracking down these changes so they can be amended. Xavier allows you to identify exactly what was changed and when within seconds. Simply input the historical reporting period that you want to check, and the close date from which you expect no more transactions to have been logged for that period, and click Run Report. Xavier queries the underlying journal transactions for the client, and looks for transactions that have a journal date within the historical period, but a created date of after the reporting close date. You'll be able to jump straight to the offending transaction(s) in Xero from the results. And, in case you need to show someone else where it all went wrong, you can always export the results to PDF. The Regular Suppliers insight is designed to analyse your client's payments to their suppliers over time and automatically detect issues. Our AI will look for months where the total amount paid is higher than normal for a supplier. Clicking a supplier will show a chart of payments over time and highlight the periods where we have detected where there may be an issue. Clicking on a bar in the chart will explain the issue that we have found and show a summary of payments to the supplier in the chosen period. You may then choose to dismiss the alert or go through to Xero to investigate. We are really excited about the possiblities here and we will be working hard to continue making this insight more powerful.